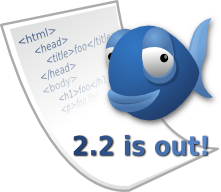 Bluefish is an open source and cross-platform software that provides web developers with graphical application for editing HTML files and create websites, as well as to write programming code and shell scripts. Bluefish is the perfect application if you're using a GTK+ based desktop environment such as GNOME, Xfce, MATE, LXDE or Cinnamon. In this tutorial i will show you how to install bluefish editor in Ubuntu 15.10 / 14.04 and older versions also.